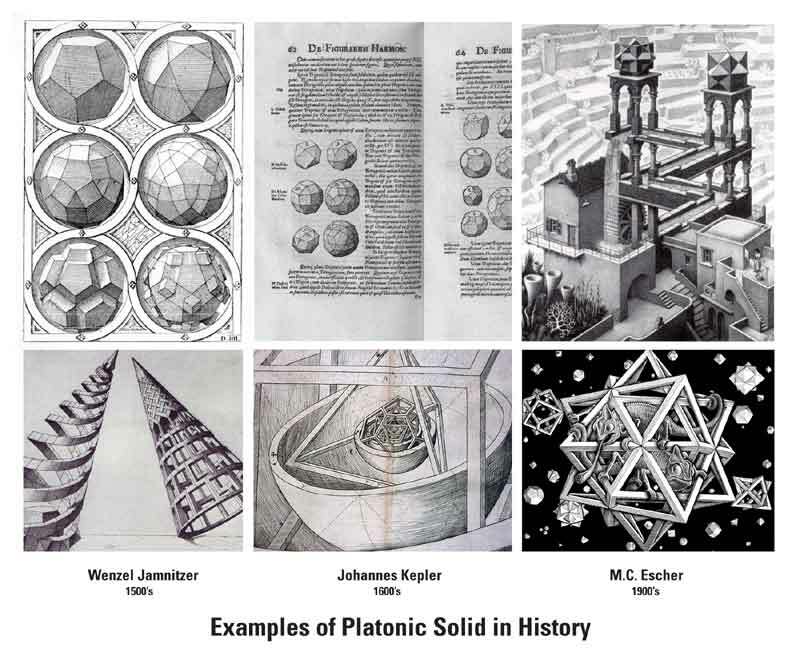 With this installment I will be covering the ubiquitous ‘Platonic Solids’, named after the one and only Plato of Ancient Greece. From a strict and logical standpoint, these forms are defined as being regular convex polyhedrons, whose faces are all congruent and made of regular polygons. In addition, there must be the same number of polygons meeting at each vertex. Obviously, this kind of definition is more suited for the mathematician and is lacking the rhythmic language of the artist. 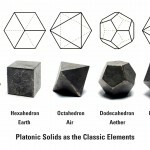 What is important here is that there are only five of these forms known to humankind, and each of them is utterly unique. 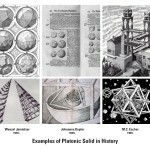 Plato theorized in his dialogue, the Timaeus, that the foundation of the phenomenal universe and it’s ‘elements’ were constructed entirely through the combination of these forms. Their shapes appear simple enough, but as I will demonstrate, therein lies the root of an incredible complexity. The contemplation of shapes, forms, and mathematics is very different today than in the times of Plato, Socrates, and Aristotle. Believe it or not, there was a time in which the study of math and geometry were considered philosophical and even ‘spiritual’. In those times there was thought to be a connection between the archetypal world (home of the deity), and the world of changing phenomena (home of our experiential universe). In the archetypal realm, there was unity and wholeness. Creation, as we know it, is at a stand still and there is balance. Conversely, in the phenomenal realm, unity has divided against itself and in order to maintain balance there must be rhythmic interchange. 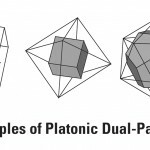 Here we see the meaning of the Platonic Solids, in that they are representations of unity dividing against itself while maintaining rhythm and balance. In this regard, each of the five forms was singled out as having a connection with the classic elements. 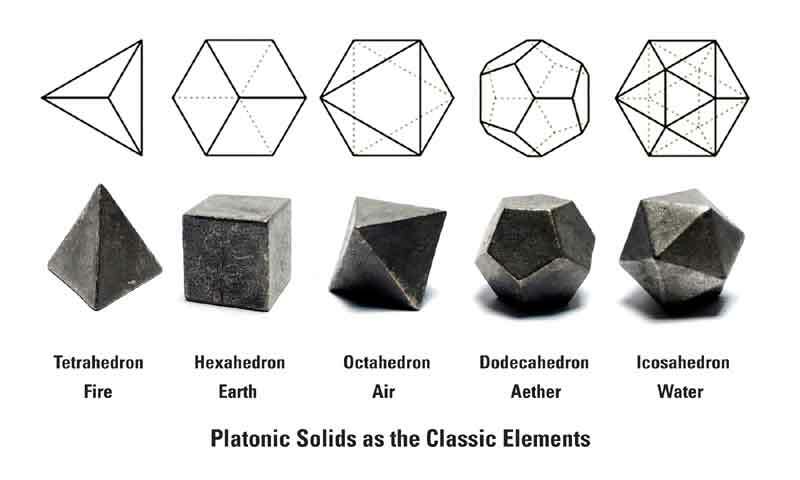 Fire was represented by four-sided tetrahedron, Earth the six-sided cube, Water the twenty-sided icosahedron, Air the eight-sided octahedron, and finally the Aether which is the twelve-sided dodecahedron (See Platonic Solids as the Classic Elements image). One would do well to note also the singular invisible centering ‘zero-points’ of these forms. -Fire represents an initial outburst of force, quite independent of direction and without restraint. The idea of movement or expansion can here be symbolized. In the mind of the human it is what we would refer to as our ‘will’. As for its Platonic representative, we have tetrahedron which is made up of four vertices, and four faces. The points of extension are severe, and this causes the form to appear as if it were an arrowhead. Combining four of the most elementary planar shapes, triangles, this form is the embodiment of the most elementary third-dimensional solid. Additive and reflective light are said in modern times to be traveling in the form of this shape, but since each straight line only represents the outermost limit of any curve, we experience this as a cone. Could this identity of light as ‘fire’ be what the ancients were attempting to communicate? Perhaps not, but it seems to be a startling coincidence. -Water represents the reception of the initial force of fire, and as such there is sense of dependence. The ideas of acceptance and sensuality are expressed here. In the human it is the ability to ‘feel’ and ‘experience’. The solid seen as water is the icosahedron which is made up of twelve vertices and twenty faces. Again the simple triangle is produced twenty time in order to produce a form that is quite difficult to hold onto, as it is the closest these forms will get to a sphere. What is commonly referred to as the ‘World Grid’, which aligns itself according to the Earth’s electro-magnetic entrance and exit points, is said to be structured with the likeness of a giant icosahedron. -Air represents the first result of the marriage between fire and water, and partakes of both qualities equally with the idea of volatilization. One gets the sense that there is a sort of struggle between the two parenting elements, and in the human this can be seen as the ‘intellect’. Our moral qualities and opinions fill us up and yet they cannot be touched or perceived by the naked eye. The octahedron has been identified with air due to the six-fold expansion from its centering point. Four triangular planes meet at the apex on either side of a single square plane. Three-dimensional space is partitioned out upon three planes which share the same axial point. If one were to imagine sitting in this axial point they would quickly discern six points of reference: forward, backward, left, right, up, and down. -Earth represents the final form or veil of the three previous elements. Here is a stable and concrete nature which characterizes the final product of any design. Ultimately this ‘shell’ or body is shattered and the entire process is repeated, or so the story goes. With this idea one should see that each and every endeavour or creative act is merely a stepping stone unto some other stepping stone. This element is represented by the hexahedron, more commonly known as the cube. Even with just a little investigation, we can quickly note that it resists adjustment more so than the other solids. The six square faces, extended out by the eight nodal points help maintain the equilibrium. It is also said that the sixty-four (4 x 4 x 4 = 64) cubit hexahedron is used as the model for the sixty-four hexagrams of the I-Ching model in Chinese philosophy. -Aether is the most mysterious element of them all. In fact to call it an ‘element’ doesn’t really do it much justice, because it is beyond thought’s reach. It was said to be in the Greek mythos the ‘essential’ medium upon which every created thing was established. The other elements were simply shadows of this most vital and hidden medium. In Hindu text this is referred to as Akasha, meaning “space”. The main characteristic of this element is Shabda (sound), which is interesting if one takes into account the geometry of the pentagon and its embodiment as the dodecahedron. This marks the last of our solids, and is made up of twelve pentagonal faces which are projected outward by twenty points of intersection. As emphasized in my previous articles, the pentagon has a tremendous amount of mystery surrounding its nature including the Golden Ratio of 1 : 1.6180339…, and also its natural equivalent, the Fibonnaci sequence of 0, 1, 1, 2, 3, 5, 8, 13, 21…which mimics the former. In essence, time and movement are implied which cannot really be said to ‘be’ anything at all. I could go on further with the theme of this subject, but my intention is to merely invoke interest in general. Delving too heavily into specifics must be done on a personal basis only in my opinion. I hope that this article has at least thrown some light upon an almost archaic set of ideals, all but forgotten by the modern man.